Syrris, a world leader in chemistry process innovation, is previewing its revolutionary Titan system at P-MEC in Barcelona, Spain, from the 4th to the 6th of October. 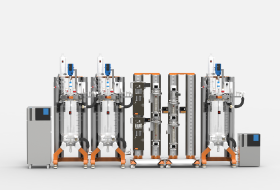 This modular continuous chemical processing system is designed to enable straightforward scale-up, from kilo lab through pilot plant to manufacturing. Titan is an easy to use, high performance turnkey system designed for long-term use in demanding manufacturing environments. It comprises a wide range of seamlessly integrated, rapidly reconfigurable modules, enabling simple or sophisticated continuous flow processes to be performed on a lab scale, or at rates of up to a tonne per day. Titan offers flexibility and scalable functionality – extra modules can easily be added – allowing the type and complexity of processes to be easily modified, or multiple processes to be combined into a single system. Reactors are available in 64 and 250 ml volumes, and may be connected together when larger scale systems are required. Reliable and robust, Titan offers extremely high chemical resistance. It can accommodate reaction temperatures from -40°C to +250°C and pressures up to 20 bar, at flow rates between 1 and 250 ml/min per channel. Process parameters can be controlled manually from the modules, or automated via Titan or pre-existing PLC or plant software.